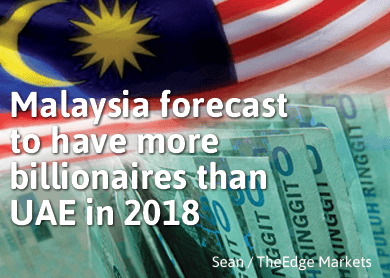 KUALA LUMPUR (Dec 9): Malaysia is forecast to have more billionaires in 2018 at 20 than the United Arab Emirates with 19, according to a new whitepaper from the London-based WealthInsight Intelligence Cente. WealthInsight’s Intelligence Center includes tracking of wealth and liquidity events as they happen and detailed profiles of major private banks, wealth managers and family offices in each market. In its December 2014 edition, WealthInsight said Kuala Lumpur is the city with the highest level of high net worth individuals (HNWIs) at 13,800 in 2013, more than Abu Dhabi (12,500), Cape Town (8,753) or Birmingham (8,736). It said that in 2013, Malaysia had over 26,000 HNWIs with their wealth standing at US$151 billion. WealthInsight said Malaysian wealth grew at the remarkable rate of 59.6% between 2009 and 2013 and is expected to increase by a further 28% to reach US$206 billion in 2018. It said the number of millionaires was expected to reach 30,054 by 2018. “Malaysia’s billionaire growth has also been large; with US$46 billion in 2013 Malaysian billionaires have 209% more wealth than the entire millionaire population of Paraguay,” it said. It said 54% of Malaysian HNWI foreign wealth was invested in Asia-Pacific countries, compared to only 46.8% of Indonesian HNWI foreign wealth. WealthInsight analyst Tom Carlisle said that since becoming an Islamic banking hub, Malaysia had seen a large surge in investment to its shores, increasing by 52.6% since 2008 to US$11.6 billion. He said Malaysia’s overall wealth was similar to countries such as Argentina (US$160 billion), Colombia (US$154 billion) and Indonesia (US$206 billion). “With a population of only 28.3 million, Malaysia has a similar number of millionaires than much more densely populated countries such as Indonesia, whose population stands at 237.6 million. “This demonstrates the big potential for billionaire growth in Malaysia,” said Carlisle. He added that unlike other economies in the AsiaPacific, the Islamic private banking sector in Malaysia had been positively influenced by the government. Carlisle said this had come in the way of infrastructure projects and increased spending in education. He said the investments over the next five years would provide Islamic private banks in Malaysia the opportunity to employ homegrown talent and provide a high quality service to HNWI clients. Carlisle said just like many countries in the AsiaPacific, Malaysia could increase wealth creation through investing significantly in infrastructure and offering tax incentives to foreign businesses to invest more in the country. “Malaysia saw a significant increase in foreign direct investment and higher levels of activity in the local stock market, performing better than the global average between 2009 and 2013,” says Carlisle. On HNWIs, Carlisle said the Malaysian economy had performed well during the financial crisis, resulting in the amount of HNWIs rising by 45.5% over the period 2009-2013 to 26,015. “Growth like this is very hard to maintain, but the high rising level of new wealth and investment in Malaysia and neighboring countries means further growth will be seen. Malaysian HNWIs are currently investing 54% of their overseas portfolio in the Asia-Pacific. “Malaysian HNWI wealth has increased substantially, finding high levels of growth and investment in real estate which will be influenced further by the high levels of GDP estimated over the next five years,” said Carlisle.